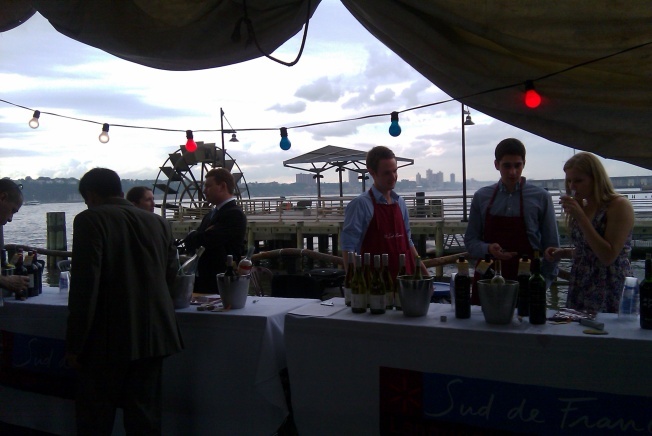 The Frying Pan--the rusted out party flotilla anchored by the Chelsea Piers--may not be the most obvious place to hold the kickoff party for a wine festival, but it is a good indication that the Sud de France is not, as one rep put it "intended to give you a headache." Last night, buckets of Corona were temporarily traded in for rosé and chardonnay and after a couple of glasses, it wasn't impossible to imagine that you were in fact adrift in the Mediterranean -- which is, moreso than varietals and vintages, what the month-long festival is all about. Yes, there will be plenty of educational experiences (from how to identify a particular blend to which sweet wine to pair with dark chocolate fondant), but more importantly, the Sud de France is about appreciating the culture of this sunny region. "When you are there, you know you are on vacation," said one native Parisian. On their own turf, they may be competing with Burgundy and Bordeaux for wine-making cred, but while in the City, the plan is to have a nice time. Each week at the Hudson Terrace, the French Tuesday party will give New Yorkers the chance to try some wine from the Langedoc-Rousillon and take a midweek break from reality. On Bastille Day, the francophiles will be storming Water Taxi Beach and, three days later, the streets of Brooklyn. And since the food of this region not only pairs well with but actually inspires the creation of some of the wines (after all, if you grow oysters, doesn't it make sense to also make a wine with which to eat them?) special pairings will be held at the Maison de la Région Languedoc-Roussillon, the festival's headquarters in Midtown. For a full list of events and to purhase tickets, visit Sud de France.